Prohibition is long gone, but the glamorous (and occasionally violent) period made an impact on Seattle that can still be seen today. For a start, the city's biggest booze runner, Roy Olmstead, broadcast secret messages to his smugglers on a radio station that became KOMO. But more importantly, Prohibition made a lasting impression on Seattle bars. 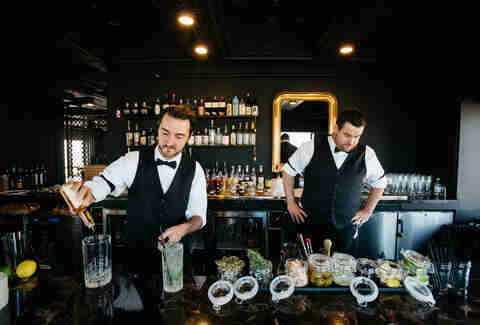 Some, like The Diller Room, have direct ties (the bar was once hidden inside a Chinese laundry), while others simply draw their style and cocktail inspiration from the speakeasy culture it created. And then there are the bars on this list. These are the places that go beyond the '20s aesthetics and attempt to capture the illicit thrill of clandestine drinking with hidden locations -- perhaps concealed inside another bar like a Russian doll, or down a mysterious alleyway, or even at the top of the KOMO radio tower once used by that old smuggler. 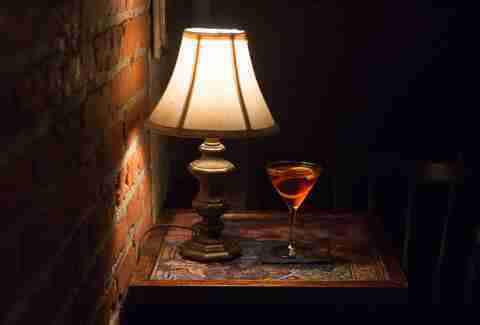 They are Seattle's very best "secret" bars. 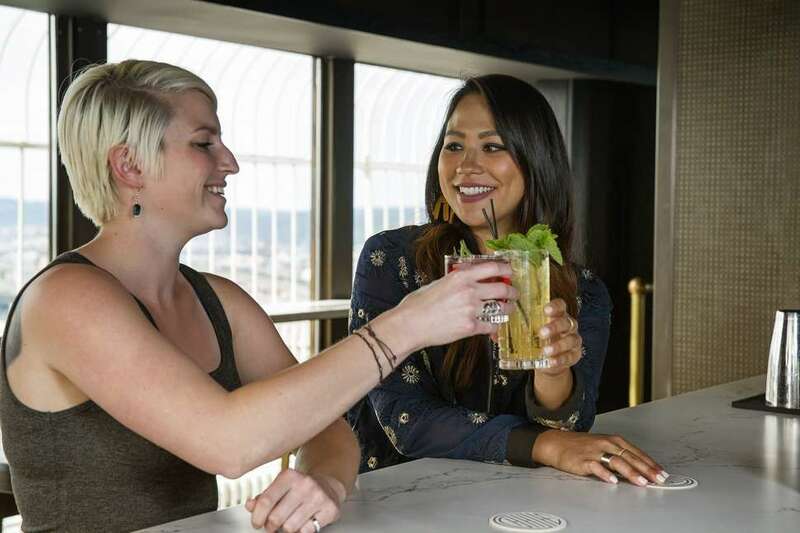 This roaring ‘20s spot opened last year on 35th floor observation deck of the city's oldest skyscraper -- and it’s supposedly where the "King of Rumrunners" Roy Olmstead ran his Prohibition-era radio station. The windows stretch from the floor to its richly detailed ceiling, providing stunning views of Seattle's skyline and Elliott Bay. The menu has the Northwest flavors of fresh Pacific oysters and Beecher's grilled cheese sandwiches, alongside Chinese dumplings, banh mi and more. How to get in: You have to buy a ticket, either for the 40-minute self-guided tour of the building, or a "straight-up" option that'll get you directly to the drinking. Posted-up in a former video store behind The Center Of The Universe's venerable Roxy's Diner, this is a classy, chandelier-laden, time capsule of a bar with Prohibition-inspired cocktails. The late-night menu (from 10pm-11pm, Sunday through Thursday) has oyster shooters for $2.50 and mugs of fries with aioli for $4. How to get in: It was harder to find before they slapped a giant, honking mural on the side of the building, but just pretend you don't see it and look for the door at the end of the dark parking lot. When it opened almost 10 years ago, on what was then an out-of-the-way block on Olive, KHSC was at the cutting edge of a speakeasy resurgence. Now, they’ve adapted the Filipino-inspired menu to include brunch and doubled the size of the bar itself by adding an underground space, with decorative wallpaper and a crystal chandelier. The extra capacity means you don't have to text ahead to get a seat anymore, but one thing hasn't changed: There's still almost no way to tell it’s a bar from the street. How to get in: Ring the doorbell and turn on the charm for whoever opens it up, or text a reservation to the maitre d'. Good luck if you’ve got a big group on a weekend though -- they can seldom seat more than a handful altogether. This bar is hidden behind a bank vault door inside one of Cap Hill's most exceptional cocktail bars, Tavern Law. 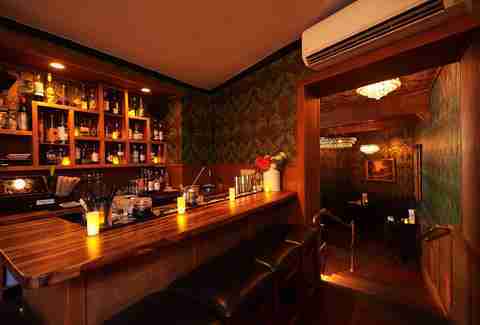 Befitting its status as a genuine speakeasy, this 25-seat space boasts a bunch of Prohibition-style cocktails -- think egg whites and Scotch. How to get in: Try your luck with the phone located next to the entrance inside Tavern Law… or call ahead and make a reservation. One of Seattle's original craft-cocktail spots, this miniature hooch-inspired bar boasts a cozy downstairs area, an actual bathtub, and a can't-miss selection of retro-cocktails. It’s hidden in the basement of the Humphrey Apartments in Belltown. How to get in: Slip into the dark alley at the Humphrey Apartments and eyeball the walls for the nondescript door. During the week, this tavern fronting a massive nightclub boasts craft cocktails, small plates, and a gastropub vibe. You can’t miss the balcony overlooking the dance floor -- come the weekend, it transforms into one big VIP area for the party below. How to get in: Dress up smart and slip through a hidden door in the bookshelf, leading into the club. On Fridays and Saturdays, you’ll need to hit the website for a reservation in advance. 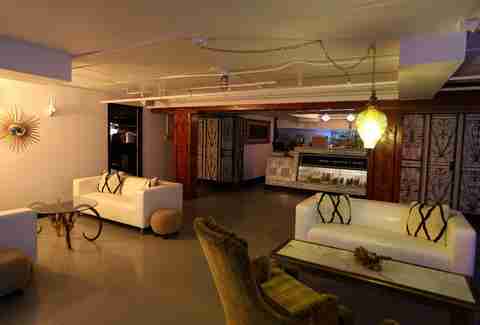 This subterranean space used to house a long-running drum & bass night, but nowadays the white brick-walled Pharmacy is an eclectically decorated lounge. It doesn't really look like a drug store (though there is an old freezer case instead of a bar) -- instead, it's designed with a nod to Palm Springs in the '60s, and boasts a long list of mid-century cocktails to match. How to get in: Head to Temple Billiards. Pharmacy is underneath the pool hall, so just head down the short hallway in the back, and look for the small neon sign that says "basement stairs". OK, so there's nothing really secretive about this place: DD was one of the most anticipated openings of 2018, which isn't surprising given who's behind it (chef Renee Erickson) and where it is (inside the glass spheres at Amazon HQ). But it does have an inconspicuous entrance, and it is sort of underneath the spheres rather than inside, so we’re counting it. The spectacular setting evokes Prohibition with it's dimly-lit, moody interior that is in stark contrast to the glittering business district outside. Plus it's only got 30 seats, which makes it inherently exclusive -- something exacerbated by the creative food and drink menu that includes an extravagant take on the Seattle Dog. How to get in: Look for the unmarked door -- it could almost be mistaken for a service entrance -- on Lenora, and try your luck. Remember how we said there are only 30 seats? And oh, it doesn't take reservations. Bradley Foster is a former Thrillist editor who is probably eating a Seattle Dog right now.